"Spring marks a particularly busy time as pests emerge, looking for sources of food, water and shelter. And, sometimes the simplest home improvements can be all that’s needed to help ward off infestations," said Patricia Hottel, technical director. Spring is here! And so are pests. McCloud Services, headquartered in South Elgin, Ill., is encouraging homeowners to be proactive and pest-proof in order to protect their home from an infestation this spring. In Chicagoland and Illinois, ants can be a spring pest to watch for, especially during the early months. 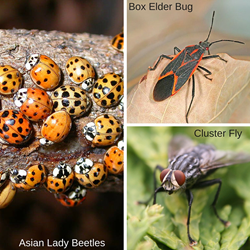 Homeowners may also see some of the common fall invaders start to become active as they search for ways out of structures. Yellow jackets and paper wasps may start constructing nests and rodents, birds and termites will also start to become active. Eliminate sources of standing water around the house, including birdbaths and in clogged gutters to help reduce biting mosquito populations. Repair leaking spigots which can provide moisture for pests like ants. Keep tree branches and shrubbery well-trimmed and away from the house. Overhanging branches can act as pest highways into the home. Keep mulch at least 15 inches from the foundation. Mulch can provide moisture and organic material for a variety of pests. Store garbage in sealed containers outside the home and dispose of it at least once per week. Avoid leaving pet food out in dishes for long periods of time. Dog food left outside can attract rodents and other vertebrate pests. McCloud Services is the leader in integrated pest management solutions. Known for providing the highest level of pest management services and customer care, McCloud Services pest management programs are designed to target immediate pest concerns with the least possible hazard to people, property and the environment. McCloud Services is a regional service provider with locations in Illinois, Indiana, Iowa, Kansas, Kentucky, Missouri, Ohio, Tennessee and Wisconsin. For more information, please visit:http://www.mccloudservices.com.